Some people are said to drink like a fish, but in a recent event here it was the fish that were getting their fill of alcohol. The fish were the drinkers in a strange ceremony dating back to the Edo Period in which lively carp are made to consume a large dose of sake as they symbolically take on people's calamities. 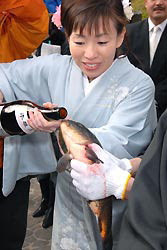 After drinking the sake, the fish are released into a river. A total of 62 people who this year were set to reach an age said to require care against calamities -- 25 and 42 for men and 19 and 33 for women -- took part in the Jan. 7 ceremony, praying for things such as long life and academic achievement. During the event, which involved proceedings at a Shinto shrine, carp were captured by men wearing traditional crest-bearing garments, and a woman dressed in a kimono poured a bottle of sacred sake into the mouths of the fish before they were released into the river. Filled up with sake, the carp at first turned belly-up on the surface of the water. But they soon recovered and swam off.